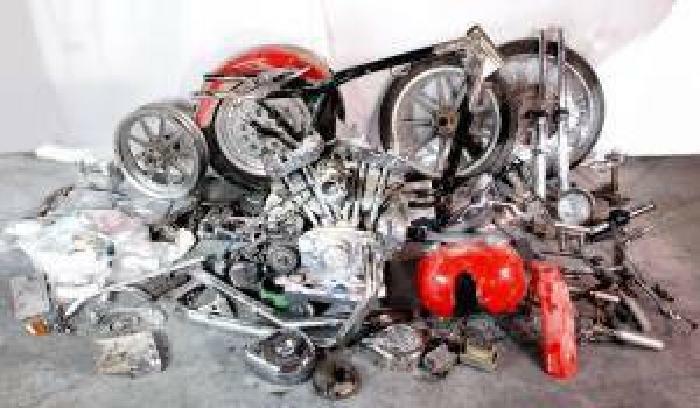 Okay, its high time I finish up this series on vintage dual carbs, or more accurately stated: dual carbs on vintage Harleys. In a previous post, I promised to offer what I see as possibly the best compromise between authenticity, performance and feasibility. For a Knuckle or a Pan, there are three basic ways to achieve dual carbs. First is the obvious: major modifications to the heads (welding and machining) for one carb with an individual runner on each head. This method is probably the most difficult and/or the most expensive. If you are a good welder, machinist, and have porting experience, then it may just the ticket. If you lack one or more of these talents, well, ...that's where the expensive part comes in. It also suffers from the drawback that, for street use, leg interference is normally a major issue, especially with Linkerts. 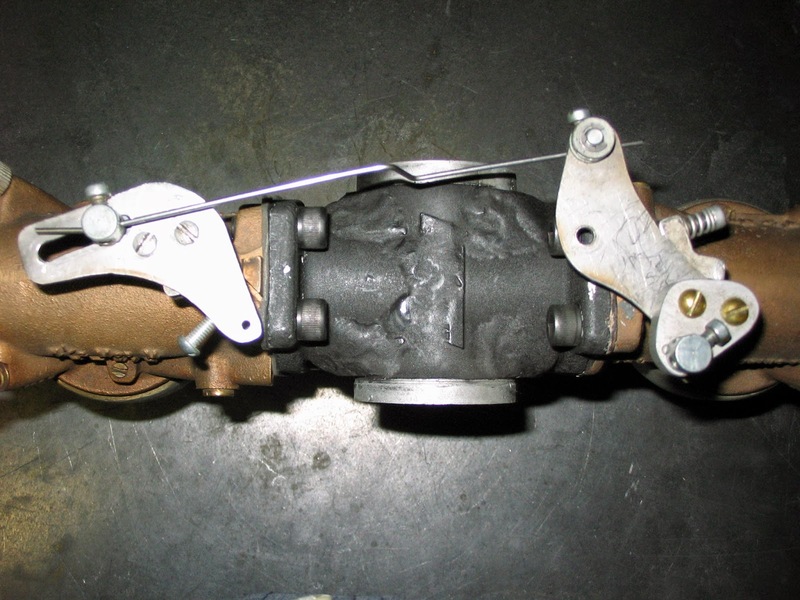 If using Linkerts or other small bore carbs, this method will also limit maximum air flow. 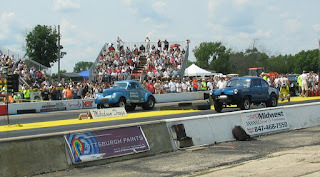 The second method is to mount two carbs on opposite ends of a common manifold, 'a la the Seely manifold of yesteryear. This is perhaps the simplest method and easiest to build. However, it does suffer from the same leg clearance problems of the first method; again, especially with the relatively long Linkerts carbs. One advantage this method does have over the first is the ability to either keep each intake track separate for true independent runner (IR.) operation, or to use the manifold as a common plenum so that each cylinder can draw from both carbs at once for maximum power potential. A third option, as I see it, is a custom manifold for two carbs mounted side by side on the pushrod side of the engine. 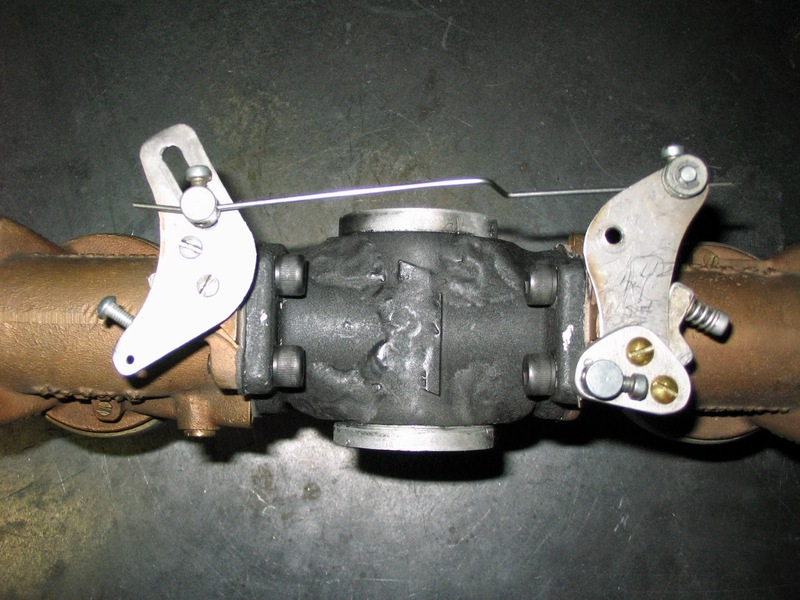 On a Knuckle or a Pan, since the intake spigots are at the far left hand (primary drive) side of the engine, this method has the advantage of providing more room to accommodate carburetor length. This allows the dual carbs to be the least intrusive in respect to legroom. 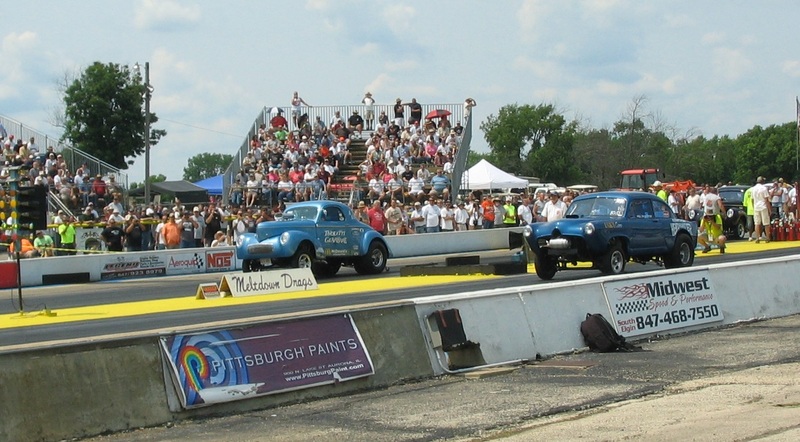 The drawback is that this last method leads to a compromise between the tuning advantage of individual runner and the increased flow capabilities or a plenum manifold which allows each cylinder to draw from both carbs. 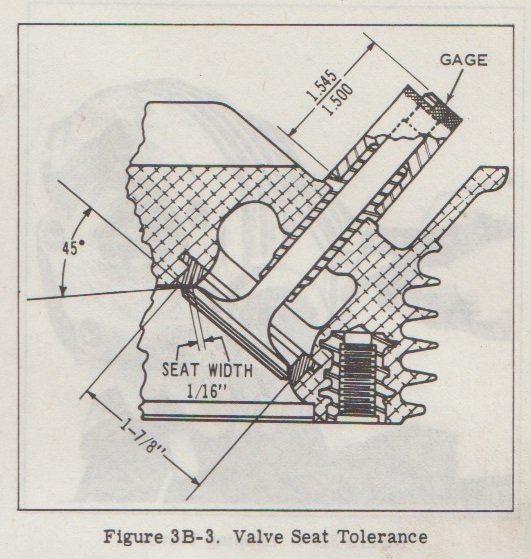 Keep in mind (as pointed out in part one of this series) that a pure individual runner manifold with carbs on the pushrod side of the engine will necessarily suffer from a "pinched" port cross section. Given the limited amount of real estate between the cylinders/port spigots, I just don't see any good way around this. That leaves us with one option (in my humble opinion) as the best overall compromise for vintage style dual carbs. That would be a manifold with a runner from each carb, which merges into a common runner before splitting off into each port. A variation of this would be for the carbs to mount on a "plenum" which then feeds into two separate runners which attach to the ports on the heads. 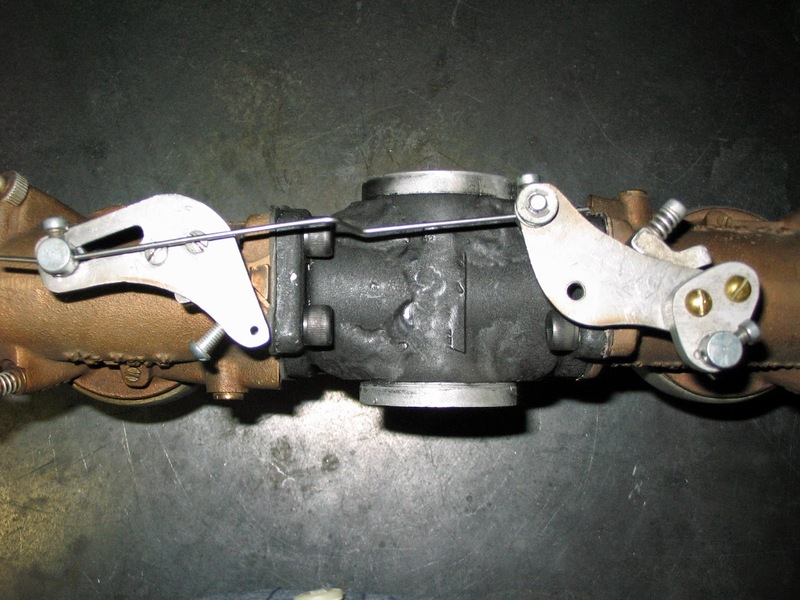 In practice, the section of either of these manifolds which attaches to the heads will essentially mimic (if not actually begin life as) a stock "T" manifold (or in the case of Shovelheads "Y" manifold. For the sake of easy identification, let's call the one a "plenum manifold, and the other an X manifold (for a Shovel it would be pretty much X shaped, though for a Pan or Knuck it would look like an X with the top legs folded down). The natural question then becomes, which is better, a plenum type or an "X" manifold. Outside of building one of each, followed by real world testing of each (including dyno testing), I really cannot give a firm answer. Now if any reader out there would care to provide me with a generous research grant along with dyno facilities, I would be glad to find an answer. As you may surmise from the increasingly length of time between blog posts, I have no spare time to donate. However, we can come get some idea of how such manifolds may work out by use of computer simulations. As engine simulation programs go, there seem to be three levels readily available. There is the very basic type which uses a limited number of inputs. While these can be fun and useful, they definitely have their limitations. The mid-level programs use many more inputs, provide for a higher level of accuracy, and of course cost more. Finally, there is the professional level simulation program with even more inputs and even higher purchase prices. The basic simulators generally can be purchased for $100 or less, the mid level in the $200-$300 range, with the professional versions in the $500 range. The simulator which I own, Engine Analyzer from Performance Trends, falls into the middle category. 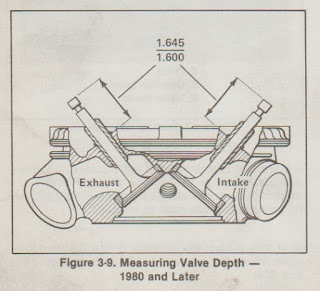 To give you an idea of the data that is utilized in this program, here is a partial list: Bore, stroke, rod length, windage, friction losses, compression ratio, combustion chamber shape, valve diameters, flow efficiency, port diameter, port volume, port centerline length, manifold diameter, manifold centerline length, manifold flow efficiency, runner length, carb cfm, ...and that only covers the first three of seven screens of data to be entered. Obviously the more accurate the data entered, the more accurate the results. The real strength in a program such as this is not in the hard numbers it produces, but rather is revealed in the company name itself: Performance Trends. 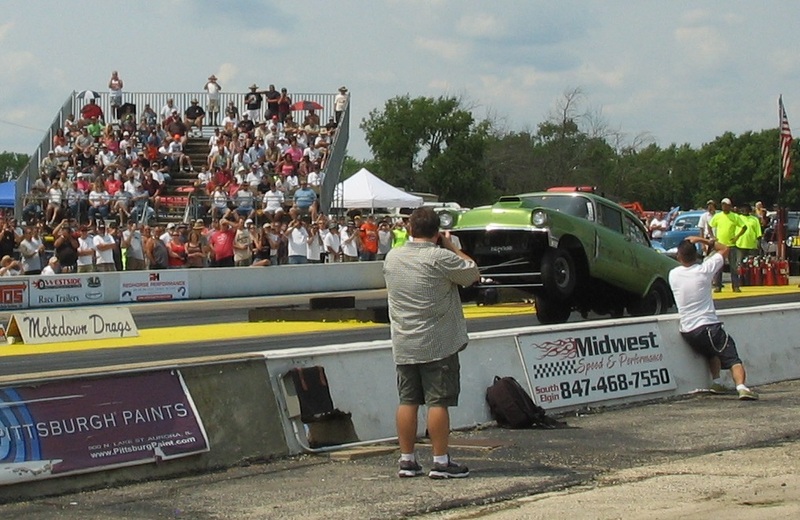 While the actual horsepower and torque numbers produced by the program may not match real world results exactly, by changing input data one step at a time, one will see a "trend" in the results. So, ...to the simulator! The logical first step was to enter everything in as accurately as possible to match a stock 74 cubic inch Knucklehead. Well, almost stock. I used the flow figures for an unmodified FHP/S&S Knuckle head along with an Andrews "N" Knucklehead cam. The N cam is what Andrews calls its "stock replacement" and though its specs don't quite match my own measurements for an OEM cam, or the S&S stock replacement Knuck cam, I already had the specs loaded into the program and deemed it suitable for these tests. As I stated earlier, the actual numbers that the program predicts are of much less consequence than the "trends" that it reveals, though I might mention that the numbers generated looked reasonable, remembering that rear wheel HP recorded on a chassis dyno will be 10-15% lower Here was the first thing of note: changing from the stock Knuckle M35 carb to the slightly larger M74 resulted in a gain in average torque (across the tested band of 1500 to 6000 RPM) of 4-1/2 foot pounds, along with along with gain in average horsepower of 4. 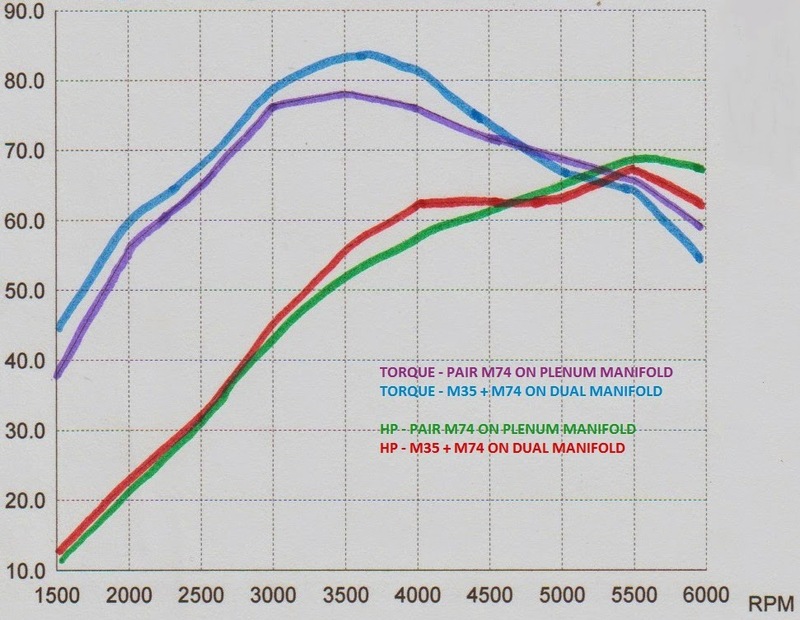 Peak torque went up by nearly 7 ft pounds and the horsepower peak went up by 5, but also peaked at 500 RPM higher than with the M35 (5000 RPM vs 4500). Next up was to input the added runner length of the dual carb "X" manifold without the additional flow capability of a second carb. This model shows an increase in both torque and horsepower across the entire RPM range, which suggests that added overall intake tract length for the dual carb manifold is a performance enhancement all by itself. But we really aren't going to the trouble of building a dual carb "X" manifold just for the length, are we? Inserting the flow from an M74 combined with an M35 results in even more impressive gains. Peak torque is up nearly 9 foot pounds compared to the M74 on a stock manifold, while peak horsepower increases by almost 13. 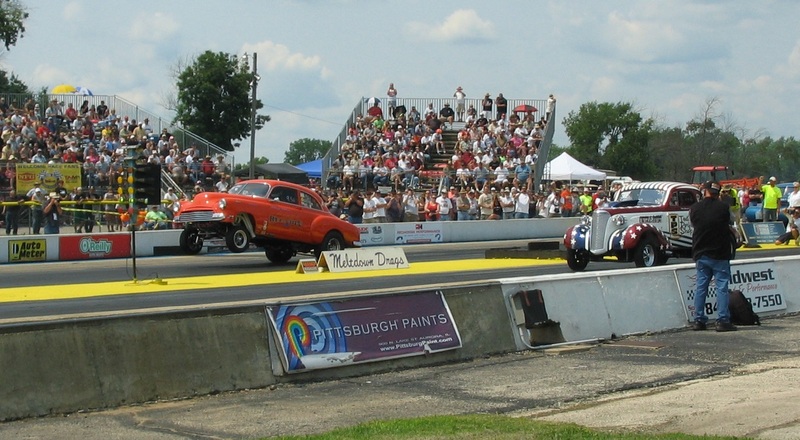 Average torque across the tested RPM range is up by 8 with average horsepower up by 7. Perhaps just as important is that the dual carb model show the torque as higher than the stock carb and manifold at all RPMs, even compared to the single M35. That would suggest that we are not going to give up any lower RPM performance in the search for top end power with the dual carb manifold. 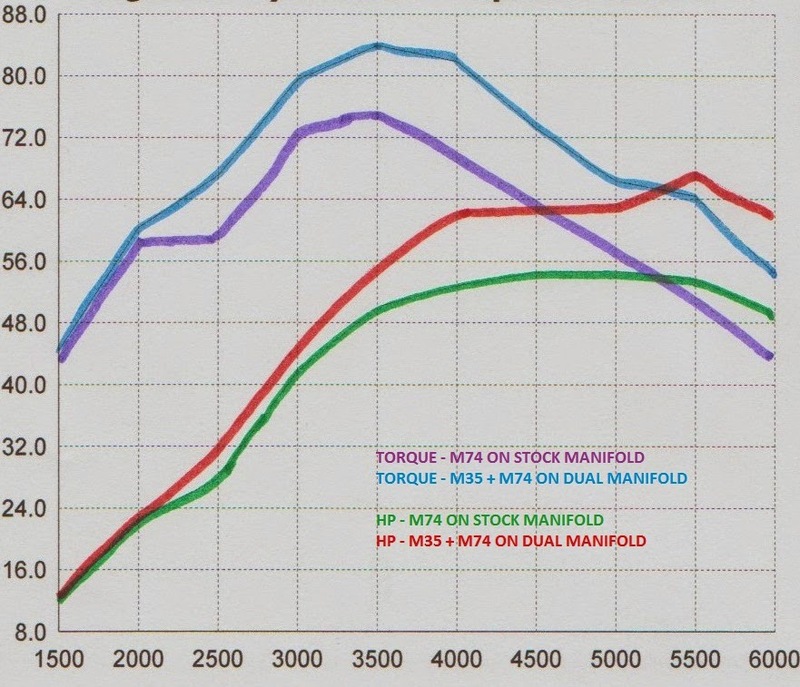 Perusing all of the data, it appears that the M35 on a stock manifold is limiting the peak torque to 3000 RPM and the peak HP to 4500. The simple change to an M74 raises the torque peak to 3500 and the HP peak to 5000, indicating the restriction of the M35. The addition of the dual carb manifold with two carbs leaves the RPM for peak torque at 3500, but raises peak HP to 5500. 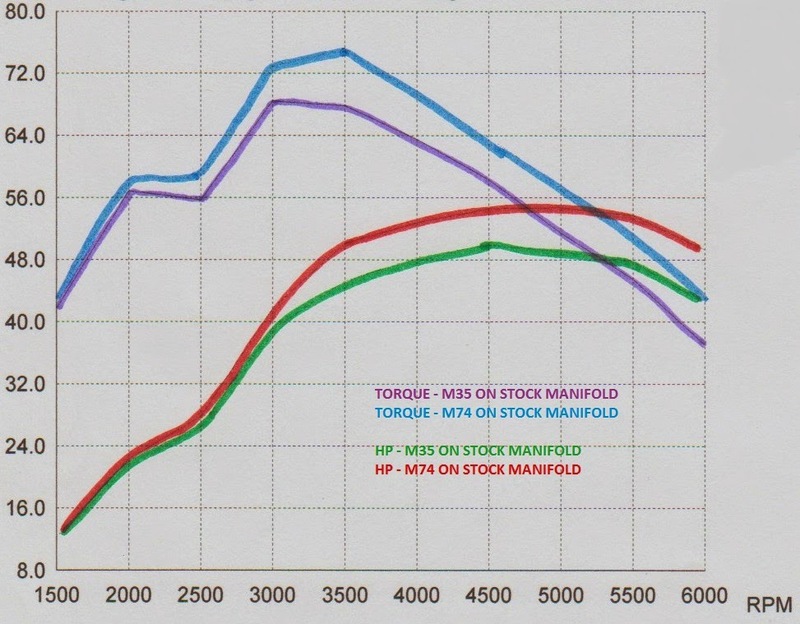 At no point in the torque curve did the M74 produce less than the M35. In fact, subsequent "runs" with even much larger carbs still showed a horsepower peak at 5500 RPM (the peak number increased, but not the RPM at which it was reached). That indicates to me that the M35 was limiting the RPM of peak HP, whereas with an M74 there is some other factor that is limiting it (in fact increasing the cylinder head air flow in the test did result in the RPM for peak HP increasing). Of course these tests don't tell us much about throttle response and overall driveability, but that's where a little personal experience weighs in. While I have not had the opportunity to field test an "X" manifold, I do have some personal experience with a "Seely" style manifold with no divider which allows each cylinder to draw from both carbs. When I built such a manifold about 25 years ago, it seemed logical to set it up in much the same way as an automotive 4 barrel carb. If you consider a typical 4 barrel, you will notice a couple things. One is that the "primary" throttle plates are normally smaller than the secondary's. The second is that the linkage provides for the primary throttle plates to open part way before the secondary plates begin to open: this is commonly called progressive linkage. 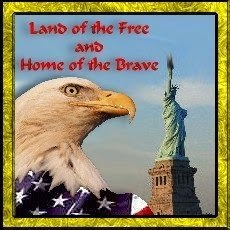 Now think about what that means for a moment. The smaller primary plates will naturally result in better fuel mileage and throttle response when you don't "have your foot in it." The larger secondary plates will allow maximum air flow for WOT (wide open throttle) situations. That should make for a pretty good all around compromise between driveability, mileage, and power. And such proved to be the case. 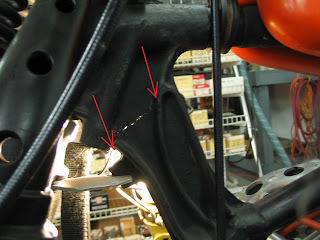 I fabricated throttle linkage (shown below) which allowed the M35 that I used as the primary carb to reach 1/2 throttle before the M74 secondary carb began to open, but which also caused both carbs to reach wide open at the same time. As an added airflow enhancement, I only ran a choke plate on the primary carb (though the choke shaft remained in place on the M74 to keep the low speed needle adjustment mechanism). Of course this setup was not on a completely stock Knucklehead, which has the potential for skewing some of the results. 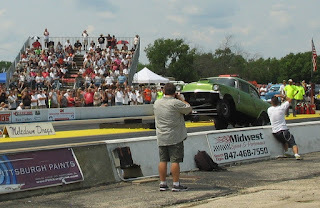 The engine remained 74 inches, but it used two right side flywheels allowing quicker revving. It also had ported heads with larger valves, along with a 110 Sifton cam; you know... typical Knuck hop up stuff of days gone by. Full disclosure; the one glitch that I never did quite work out entirely to my satisfaction (at least from a curiosity standpoint) was the idle speed. With the circuit breaker at full advance the idle speed would remain too high despite my attempts to disable the idle circuit of the secondary carb. I think it was due to my use of typically worn out Linkert carbs (with excess wear to the bodies at the throttle plates) allowing too much air to sneak through. Since I did not have any better carbs to try, I "solved" the problem by installing a late '60s auto advance circuit breaker which I did happen to have in my parts stash. 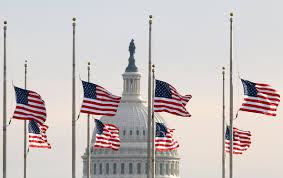 Problem not solved, but symptoms masked. 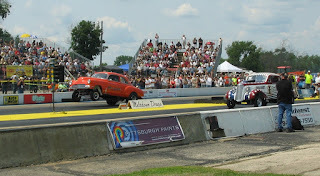 Whether I was correct that the source of the high idle was worn out carbs, or if I simply did not do a good job of disabling the idle circuit remains to be seen, and any input from someone with similar experience is welcomed. So, there you have it, an "X" shaped dual carb manifold; ...my best compromise solution for dual carbs on a vintage Big Twin. No need to do extensive and expensive modifications to your heads. By avoiding the short runner length of a plenum type manifold, RPMs for toque and horsepower peaks stay at a street friendly level. And perhaps one of the biggest advantages is that it sticks out less than 3 inches further than the stock set up, or about an inch more than an S&S E.